Summers in India are only just beginning, and it's already sizzling — are you safe? Since 2010, there have been 6,000 reported deaths from heat stroke in the hot weeks before monsoon arrives. Winters this year went on longer in some parts of the country, and now summer is here — and its hotter than before. As North India looks back at a longer-than-expected winter and some disturbances from the west that brought sleet and hail in February and early March. 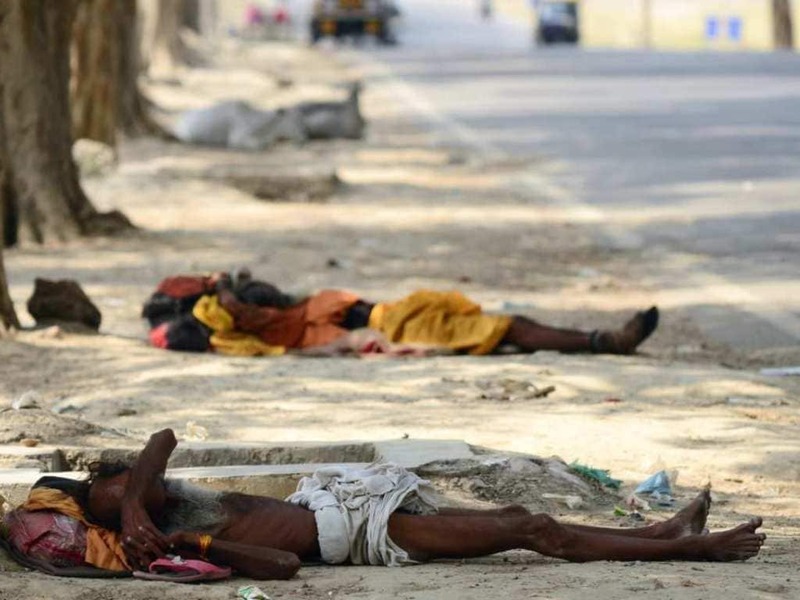 The South saw a heat wave on 6 March, according to the India Meteorological Department (IMD). And most of the country saw temperatures soar in the last week of March, with heatwaves expected to intensify in the first week of April, according to US-based AccuWeather's forecasts. IMD released a warning of 31 March of "heat waves in many places and a severe heat wave at isolated pockets" in Madhya Pradesh till 4 April. Temperatures in most places, they added, have risen by at least 3.1°C above "normal" levels. The highest temperature (of 44.5°C) was recorded in Madhya Pradesh’s Khargone city on 30 March. After lightning strikes and earthquakes, heat waves are the biggest natural disaster killer in the country. However, the Indian government doesn't classify it as a "natural calamity", and the IMD started releasing warnings and advisories for heatwaves only in 2016. "Summer heat has arrived early the past few years across India," Adam Douty, a senior meteorologist at AccuWeather told Quartz. 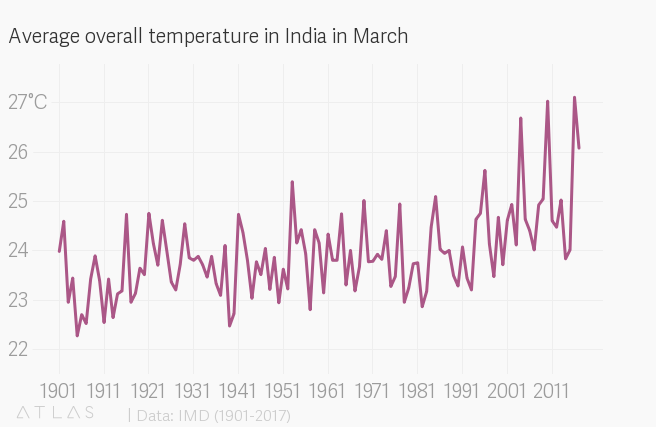 "Each year since 2016, there have been high temperatures in excess of 38°C in New Delhi and most of India during the second half of March." Douty added that 2015 was the last year that India saw "normal" temperatures at this time in the year — the start of summer heat. Other parts of the country have it just as bad, if not worst. On 6 March, the Dharmapuri weather station in Tamil Nadu recorded a maximum temperature of 40.2°C — the highest ever recorded in March in the area, beating the previous record of 40°C from 1996. Vellore, too, recorded its temperatures as the highest in the state at 40.6°C. Tiruchirapalli, Salem, Madurai, and Karur Paramathi are some of the other towns in Tamil Nadu that recorded their maximum temperatures close to the 40°C-mark, Down to Earth reported. "While actual temperatures may not be as extreme in Mumbai and other coastal areas with highs in the low-30s°C this week, high humidity will create dangerously-high 'RealFeel temperatures' in excess of 38°C Wednesday into Friday," AccuWeather said in a 1 April report about the week to follow. These temperatures may not improve till monsoons begin in June, a senior AccuWeather meteorologist Jason Nicholls goes on to say, adding that temperatures may not fluctuate as much by the end of April this year, but the heat will still be potentially dangerous. India endures lengthy heat waves each year before monsoons arrive, during which time over 6,000 heat-related deaths have been reported since 2010, a Times of India report claims. There are many precautions that can be taken to stay safe during unusually-warm weather that can cause a variety of heat-related illnesses. Wearing light clothing, staying hydrated when you're on the move and avoiding intense physical activity in peak afternoon heat (the hottest time of the day) are the easiest ways to avoid a heat stroke. Here are some more ways to keep yourself safe during the hot days ahead. Pets and animals, too, suffer the same consequences we do in a heatwave. Here's how you can help them stay safe in the heat.